The book Post-Scarcity Anarchism by Murray Bookchin outlines an adaptation of anarchism to a new technological context. It has been over four decades since the essay Towards Liberatory Technology was written, meaning our potential for liberatory technology is far greater than it was when he wrote that essay in 1968. Bookchin’s train of thought can be summed up by gift/need/ability-based decentralism/confederalism, with participatory democratic processes within rules prohibiting authoritarianism, social ecology, liberatory technology, and the means and ends of libertarian municipalism. What literally defines social ecology as “social” is its recognition of the often overlooked fact that nearly all our present ecological problems arise from deep-seated social problems. Conversely, present ecological problems cannot be clearly understood, much less resolved, without resolutely dealing with problems within society (Bookchin). By changing how we relate to each other, we can change how we relate to our environment. Market principles use profit as a mechanism to ration finite resources. Market principles will help the ecosystem to the degree that helping the ecosystem will maximize profit, and they will harm the ecosystem to the degree that harming the ecosystem maximizes profit. This translates to the transformation of life into non-life to the degree that it maximizes power and profit. The market creates an economic hierarchy. The best way to maximize profit is through authoritarian relations—privately owning the means of production and using the state as a mechanism to maximize profit and enforce the private ownership of that which others use. A huge source of ecological problems is also ignorance of available technology, available resources, and our interdependence to each other and our ecosystems, of alternative social systems, etc. Ignorance may never disappear, but we can certainly minimize ignorance in regards to certain areas of knowledge (and by extension minimize harm done to each other and to our environment). Our eco-communities shape our relationships to each other, and our relations to each other shape our eco-communities, which then shapes our relations to each other and so on and so forth in a seemingly never-ending dialogue between society and the environment(similar to the dialogue between individuals and collectives). This framework for viewing the human and ecological problems, leads to the conclusion that we need non authoritarian social forms (or forms of freedom) in order to care for the wellbeing of humans and the ecosystems we are dependent upon. The market and the state turn the organic into the non-organic to the extent that power and profit are maximized. This inevitably has ecocidal consequences. To get rid of ecocide, we must get rid of the market, the state, patriarchy, white supremacy, and minimize behavioral authoritarianism. Anarcho-communism advocates using decentralization of power as a mechanism to create a stateless, classless, moneyless society without authoritarian systems or behaviors. In such a system, resources would be distributed according to abilities and needs. Anarcho-communists advocate personal property, anti-authoritarian collective property, and common property as well as gift—from individual to collective, collective to individual, individual to individual, and collective to collective—as a mechanism for distributing resources. Anarcho-communism provides us with an excellent analysis of the forms that we should NOT have, and aspects of the forms that we should have. Even if we had the most free forms possible, the content within such forms can theoretically be antithetical to the aims of anarcho-communism. The content we ought to have should to be based on liberatory technology in the aims of achieving a post scarcity society. The form of institutions that Bookchin advocated were municipal assemblies based on participatory democracy within free associations (freedom of, from and within associations checked and balanced by freedom of, from, and within associations of others). Individuals would retain rights to leave associations, without harming free association of others, and stay within an association while disagreeing and opting out of participating in that which they disagree with. Bookchin did not think we could magically abolish power. Instead, Bookchin advocated decentralization of decision making power and confederations, which are associations of free associations. Bookchin was for governance without statecraft: “Confederalism is […] a way of perpetuating the interdependence that should exist among communities and regions — indeed, it is a way of democratizing that interdependence without surrendering the principle of local control (Bookchin).” Decentralization of decision making power was necessary but not sufficient for Bookchin. For many associations to associate without authoritarian relations, confederalism needs to be implemented. 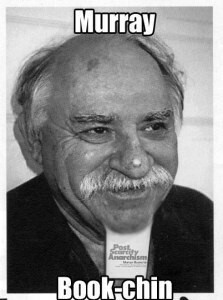 Bookchin called his views towards the end of his life communalism. Bookchin said “As an ideology, Communalism draws on the best of the older Left ideologies—Marxism and anarchism, more properly the libertarian socialist tradition—while offering a wider and more relevant scope for our time. From Marxism, it draws the basic project of formulating a rationally systematic and coherent socialism that integrates philosophy, history, economics, and politics. Avowedly dialectical, it attempts to infuse theory with practice. From anarchism, it draws its commitment to anti-statism and confederalism, as well as its recognition that hierarchy is a basic problem that can be overcome only by a libertarian socialist society.” Bookchin felt even anarcho communism, in describing that it was against the state and for communism, did not fully express what kinds of organization/rules/institutions would exist. Bookchin realized towards the end of his life that anarchism, although defining what it was against (private property and the state and in its more mature forms hierarchy in any form), did not sufficiently state what it was for. For Bookchin, even anarcho-communists were too vague in regards to the forms of freedom they advocated for. Bookchin was insistent upon participatory democracy as a mechanism during and after we transition to a society without states and markets. Bookchin advocated a democracy that is direct, inclusive, and based equality of decision making power. Bookchin advocated for a constitution with non-hierarchical obligations and rights, and deliberative participatory democracy within the limits of the constitution. Bookchin advocated majority preference within a set of rules that prohibited authoritarian relations. Bookchin also advocated for the rights of minority preferences to dissent and do what they want within the rules of society. In this sense majority and minority preferences would be respected, the individual and society harmonizing as much as possible due to these boundaries, creating social freedom. When different preferences are compatible they can all occur, and when there is an incompatibility between various preferences, the majority decides. The content of liberatory technology minimizes such incompatibilities between various preferences. Liberatory technology is the art of applied science with an empathetic, anti-authoritarian ethic. Liberatory technology is technology used in an ethical way to maximize well-being of all. Logic without compassion can lead to more efficient ways to perform slavery, war, and genocide. Compassion without logic can lead to people supporting the market and the state by being ignorant of what they support. Logic is necessary but insufficient for maximizing the wellbeing of all. Compassion is necessary but insufficient for maximizing the wellbeing of all. The chapter “Towards a Liberatory Technology” is one of the most important 20th century anarchist essays as far as ideals are concerned. Bookchin adapts the dreams and aspirations of anarchism to a post 1960s technological context. This technological context includes the automation of labor, geothermal, solar, wind, wave, tidal energy, thousands of resources through hemp (including plastics, paper, and much more), aeroponic gardening, vertical gardening, permaculture, rain water collection and purification systems, etc. However, Bookchin is neither a technophile nor a technophobe. Bookchin recognizes the capabilities for authoritarian and liberatory technology, and by extension how we can be in harmony with the global ecosystem or how we can destroy it. If Bookchin was a pure technophile, like some of his critics claim he was, there would have been no need to add the term “liberatory” to technology, for it would be superfluous. Liberatory technology implies a logic guided by an empathetic, anti-authoritarian rudder. It is easy to foresee a time, by no means remote, when a rationally organized economy could automatically manufacture small “packaged” factories without human labor; parts could be produced with so little effort that most maintenance tasks would be reduced to the simple act of removing a defective unit from a machine and replacing it by another—a job no more difficult than pulling out and putting in a tray. Machines would make and repair most of the machines required to maintain such a highly industrialized economy. Such a technology, oriented entirely toward human needs and freed from all consideration of profit and loss, would eliminate the pain of want and toil—the penalty, inflicted in the form of denial, suffering and inhumanity, exacted by a society based on scarcity and labor (Bookchin). “Necessary” liberatory technology is the liberatory technology necessary to maintain the forms of freedom. The surplus liberatory technology is liberatory technology that isn’t necessary for anti-authoritarian social relations, but is desirable for greater well-being of all and the environment we are dependent upon. The framework of social ecology and the content of liberatory technology make the forms of freedom more resilient. Form and content, although distinct, are interconnected. Different forms are more conducive to liberatory content. However, as Bookchin points out, the most liberatory form can bring about authoritarian content—although liberatory forms do minimize such authoritarian content compared to authoritarian forms. This can happen through lack of logic and/or lack of compassion. This is why liberatory forms are necessary but insufficient in regards to bringing about the end goals that they aspire towards. Education is more than essential, not just for why to have an anti-authoritarian society, and how to get to an anti-authoritarian society, but also for after such a society exists. Such education is necessary to provide liberatory content in order to maintain the forms of freedom and contribute to the wellbeing of all. More accurate frameworks of how we view the relationships of humans to the environment are essential to help arrive at such form and content, and also to nurture such form and content—both so the form and content can become more liberatory, and also to prevent such liberatory forms from perverting into authoritarian forms. With the content of liberatory technology, the form of libertarian municipalism, as well as a framework of social ecology, a post scarcity society could exist and maintain itself. The content is in dialogue with the form. The form effects the content, and the content effects the form. Ignorant content within a society based on freedom can lead to artificial scarcity and the transformation from freedom into a hierarchical society. Anarchism as a form is not in and of itself sufficient. We must look beyond anarchism into the field of liberatory technology (empathetic applied logic) during and after the transformation of society from authoritarian to anti-authoritarian. The more we understand society and ecology, the more we understand the relationships between humans and humans and humans and ecosystems. In order to understand human cognition/behavior, I think we ought to look at the biopsychosocialecotechnological model of human behavior, which sees biology, our psyches, social systems and behaviors, eco-communities, and technology in a dialogue, each component directly and indirectly interdependent upon one another in shaping who we are. Through greater knowledge of human cognition and behavior (nature and nurture), we will arrive at better techniques to change our relations to each other and to the environment we are dependent upon in desirable ways. If our viewpoints of the world don’t recognize our interdependence upon each other and our environment, we can arrive at violent decisions through ignorance alone. Aims at showing a different way people can organize (building the new world within the shell of the old) during and after a transition to a stateless/marketless society. At a time where labor has little power due to technological unemployment, it is essential that we find new ways to build the new world within the shell of the old. The democratic assemblies would bring people together organizing without rulers (showing a new way people can organize), meet people’s immediate needs within the communities, and take faith and power away from the state and the market. It is essential that these the assemblies created through libertarian municipalism are made out of the general community and not only the activist community. This must be a movement of commoners, by commoners, and for commoners. Anti-authoritarian activists are essential catalysts for such organization (in regards to education), but municipalism must extend to community members to be effective at building the new world in the shell of the old. Municipal assembles can cooperate with worker and community owned co-ops and form a worker/community union. In a mutually beneficial association, worker and community owned co-ops and municipal assemblies can support one another. This third sector, the community sector, would then live alongside the market and the state, while confronting the market and the state. The community sector would protect the people during and after the transition to a liberatory society. If the municipal council does not confederate with other municipal councils, then it merely serves as a mechanism to make that community more free. However, if there are many municipal assemblies that confederate, it becomes a strategy for abolishing socioeconomic hierarchy that contains within it the forms of freedom that can be implemented after socioeconomic hierarchy has been abolished. Libertarian municipalism can organize all forms of commoners, from workers, to the youth, to the elderly, and to the unemployed, and beyond. People ought to organize on behalf of common humanity and care for others rather than purely selfish reasons. These organizations can pool together resources from those willing and able to give towards community projects, such as fighting against landlordism and building community gardens out of the unused land throughout the neighborhoods, setting up skill shares and free freedom schools and tool libraries, etc. The forms of organization will be organic, for outside of the market and the state people already organize in participatory ways amongst friends. It is just a matter of carrying this participatory organization into a more formal setting and uniting underneath non-hierarchical and liberatory principles. Without the inefficiency of bureaucracy, and with mutual aid from individuals and confederated municipalities, these organizations would be able to do a lot with a little. There needs to be a holistic outlook on the wellbeing of all of humanity, and by extension the ecosystem we are dependent upon. This could unite people across classes/cultures to create a better world for all (meaning doing the most to help well-being of all as possible with the limited resources at our disposal). To achieve the end goal of is a dynamic confederated society based on participatory democracy, libertarian municipalism proposes a process of decentralizing power and confederating associations that use participatory democracy. Libertarian municipalism proposes a radically different form of economy one that is neither nationalized nor collectivized according to syndicalist precepts. It proposes that land and enterprises be placed increasingly in the custody of the community more precisely, the custody of citizens in free assemblies and their deputies in confederal councils. How work should be planned, what technologies should be used, how goods should be distributed are questions that can only be resolved in practice. The maxim “from each according to his or her ability, to each according to his or her needs” would seem a bedrock guide for an economically rational society, provided to be sure that goods are of the highest durability and quality, that needs are guided by rational and ecological standards, and that the ancient notions of limit and balance replace the bourgeois marketplace imperative of “grow or die.” (Bookchin). Bookchin is advocating communalization of property as opposed to collectivization that syndicalism advocates. Non-authoritarian collective property would exist within the framework and within the limits of the rules of the commons. The word politics […] expresses direct popular control of society by its citizens through achieving and sustaining a true democracy in municipal assemblies — this, as distinguished from republican systems of representation that preempt the right of the citizen to formulate community and regional policies. Such politics is radically distinct from statecraft and the state a professional body composed of bureaucrats, police, military, legislators, and the like, that exists as a coercive apparatus, clearly distinct from and above the people (Bookchin). Before, during, and after the fall of states and markets, there need to be institutionalized forms of freedom so we don’t fall into the tyranny of structurelessness or the lowest common denominator. For this to happen we need to be educated in regards to logic, empathetic in regards to emotions, willing and able to do the initial work to get an anti-authoritarian economy off the ground, and educated in regards to the forms of freedom, the content of freedom, and the framework of freedom: participatory democracy, liberatory technology, and social ecology. The confederated municipal councils will build the new world within the shell of the old.